Trust is a building block in any dealer’s relationship with their customers. At Glyn Hopkin, there is an understanding that if customers trust you, and are satisfied with the value they get from you, then you have a strong chance they will not stray. The AM100 dealer group’s desire to “meet and exceed customer needs and expectations” has led to it trying to better set those expectations in sales and aftersales. Cohen said that before the company introduced the pledge two years ago, it found half the calls it received each afternoon were from service customers wanting to be reassured that they could collect their car on time. The pledge has significantly reduced such time-consuming calls, and the occasions when it has had to provide free services are now very rare, said Cohen. The group also added an online progress system, which customers can log into to track their vehicle through the workshop. Glyn Hopkin’s philosophy is to keep customers happy and secure their future custom. Cohen said without its “meet and exceed” mantra, the group would not have been able to expand as it did while keeping its dealerships performing well. Since the last recession, it has consistently delivered returns above the industry average from a portfolio of franchises that, Nissan aside, lack segment-leading products. Achieving that takes strong controls, motivated people and an ambition for efficiency and consistency. That led the company to remove receptionists from its dealerships in favour of controlling incoming phone calls through its central contact centre. Cohen said it ensures customers in the dealership get uninterrupted service, and managers can check that phone enquiries passed on to their teams are being handled appropriately. “You know how easy it is for a salesperson to take a call and say they’ll ring someone back, and not do it. Whereas here, the minute someone makes an enquiry they’re logged onto our Contact Advantage system and enter a chain of contacts ensuring they are followed through at various points in the customer journey. We can only do that because everything comes through one central point,” he added. Service bookings are handled in the same way, with the contact centre ensuring relevant add-ons are offered to the customer in a consistent way. Administration takes a similar approach. Sales invoices and vehicle taxation are managed centrally, and delivery vans shuttle out from headquarters daily with the documents each dealership requires for its handovers. “We’re getting massive benefits, because we used to have an administrator and an accounts person at each dealership, then with holidays and sickness we’d have problems, also they would all operate in different ways. By controlling it here, we get consistency and cover, and because all our directors are here we can see what’s happening because what they do has a massive impact on the financials,” said Cohen. At dealership level, he sees each site as following the Glyn Hopkin ‘blueprint’, with some elements modified in line with franchise demands. “If you went into any Glyn Hopkin dealership, hopefully you’d find the same experience, the same set-up, the same core values and approach,” he said. The system provides the group with flexibility and simplicity – if it needs to move a manager from one brand to another, the systems and the processes are the same so the manager can quickly settle and learn the nuances of the new brand. Likewise, its acquisition strategy has benefited – two or three employees will move into the acquired dealership to begin to implement the group’s culture and processes as quickly as the signage can be changed. franchises, and completed acquisitions that have spread its reach into Cambridgeshire and Bedfordshire from its Greater London and Essex heartland. The company will mark its 25th anniversary in 2018 with some showroom-based events and competitions throughout the year to keep the milestone in the minds of employees and customers. 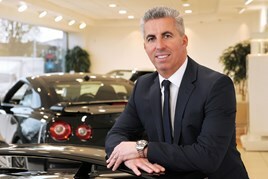 Cohen credits Glyn Hopkin’s eponymous founder for starting as an ambitious 30-something dealer principal with one Nissan site and building up a large group, still with the Japanese brand as its major partner across 14 locations. Its second-largest partner, Fiat, has been on board since 2000 and occupies 10 sites. Cohen said there is a strong sense of loyalty across the business, and it has stuck with many partners through their ups and downs. He believes this brings mutual benefits, including spreading PR messages about the strength of its partnerships, such as being the dealer to deliver the UK’s first Nissan Leaf electric car. “When you go through difficult times in the broader economy, part of the success of your business is not just from your staff and customers, it’s also having the backing of institutions and suppliers that know we can still give you the level of service that’s in line with expectations,” he said. The company has banked with RBS since it started, and still uses the same advertising agency. Cohen said some suppliers are keen to help it mark the anniversary. At the end of 2017, it still had 36 employees with more than 20 years of service, including Cohen, and 108 with 10 to 20 years’ service. On reaching 20 years with the company, staff receive a loyalty cash bonus from the company and an engraved Mont Blanc pen and card from the directors, all presented to them by Hopkin, who remains chairman. Cohen and fellow directors recognise employees’ own milestone birthdays with a gift card and handwritten personal message thanking them for making the difference at Glyn Hopkin. “It’s amazing how that is received by the staff, that we’ve remembered them out of 800-odd staff,” said Cohen. Company policy has been to provide staff with a career path, should they wish to progress. Cohen and most of his fellow directors have come up through the business, and he believes providing career opportunities, including through acquiring businesses, help the group retain its staff. New recruits are sought through traditional channels plus a new programme of ‘open days’, where interested job seekers can have an informal chat with recent recruits and long-servers before deciding whether to lodge an application. Those selected are inducted about every six weeks, and receive a presentation at headquarters then meet the directors for a coffee and Q&A session, so they can find out about the business and its culture, and understand the scale of the business. Occasionally they will meet Hopkin himself if he has come into the office, but Cohen said the chairman is not generally involved in the day-to-day operations – since promoting Cohen to managing director in 2003, he has trusted the management team to run the business and provide daily figures, and he now has other ventures, including part-ownership of Dagenham & Redbridge Football Club and the Glyn Hopkin Charitable Trust, which helps autism sufferers find employment locally. The group has been structured to ease the flow of information and help each brand get the right amount of attention. Sites do not have general managers. Instead, sales managers based at the dealerships report to a respective brand head, each of whom is answerable to Cohen and Stuart Hodson, his operations director. In aftersales, a director and two regional managers oversee performance across the business and report to Hodson. There are also deputies in the sales management and regional management functions, to support and provide potential successors. Cohen said this arrangement is a pillar of Glyn Hopkin’s financial performance. “General managers usually have more experience in one side or the other (sales or aftersales), and in my experience you’ll find a branch that is very good at one, but not the other. We get a balanced approach with dedicated focus on both. It’s also allowed us economies of scale, clear lines of communication and a common group approach. “I think manufacturers like the fact that, whether they’re our biggest partner or not, they have a brand head who is only interested in them, who knows the product campaigns and ensures it’s all dealt with and controlled. Industry talk about higher basic pay and five-day working weeks for sales staff hasn’t convinced Cohen that franchised dealers can change employee rewards without adversely affecting the business. The group has built a reputation for demanding a lot but paying well, he said, and he believes it is important for staff to know that those who work hard will earn good money and have a career path. “It has always been a target-related business where you need individuals that are hungry for success. From some of the businesses we’ve been involved in, if it’s the other way there’s nothing really to drive them on. It’s about finding that happy medium. Customers who consider a car, but want to return with their children for a test drive won’t want to be limited to when their sales executive is available, he added. Like many dealer groups faced with a declining new car market, Glyn Hopkin wants to sell more used cars in 2018. Cohen sees benefits here from the group’s scale in its franchises, as the dealerships can sell used stock held across the group. About 99% are cars from the brands held, because the group has confidence in what will sell well. “We have a really good used car profile, with a good age spread. Because we have been going a long while and because we are very good at retaining customers, we always have plenty of part-exchanges,” he said. Suitable service customers’ cars are routinely prospected to move them into a new model and secure their part-ex for stock, which then gives the business a stronger marketing message for the used car because it was supplied by Glyn Hopkin from new, he said. Used cars are also sourced from Motability and the manufacturers’ programmes. All part-exchanges not suitable for stock are sent to Glyn Hopkin’s remarketing partner, BCA Enfield, via BCA’s Dealer Pro system, which arranges collection and entry into an auction every Saturday. “If you do it properly and manage it well it’s a very lucrative part of the business. We have 200 to 400 cars every week in there,” said Cohen. The group recognised it had to maximise its profits from part-exchanges, so in 2017 appointed a used car director, Sally Germain, who was promoted from group used stock control manager. She also ensures the information about the cars sent to auction is correct, to prevent a car being “undersold” because trade bidders are unaware of some important features. The board has ruled out separate used car sites for now, because they would need to be away from its franchised dealerships’ territories to avoid “cannibalising your own opportunity”, said Cohen. This would make controlling the operation difficult and the benefit hard to predict, he said. Other groups have typically done so fairly cheaply to utilise empty properties left after showroom relocations, he said, which is not the case with Glyn Hopkin. It closed its only Infiniti franchise last autumn and is redeveloping the multi-franchise site at St Albans to expand the Renault and Dacia operation there, create a new workshop, and to add Renault’s Alpine performance car franchise this year. 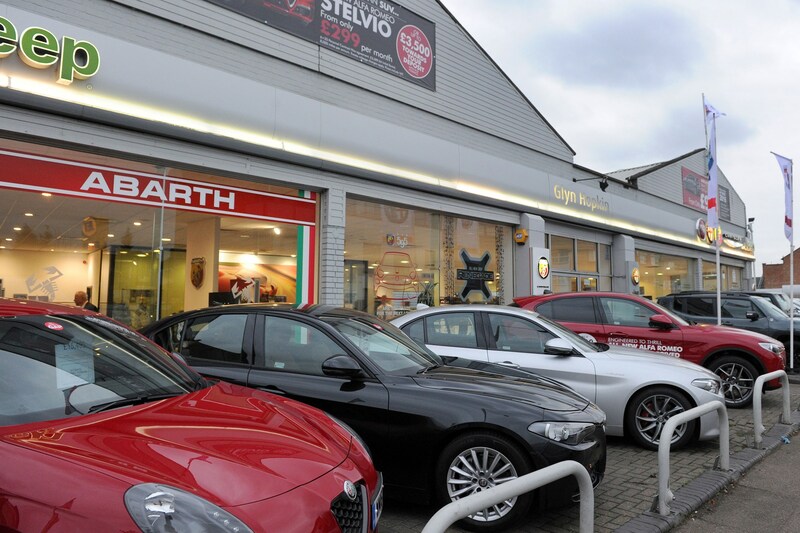 The group also has Alfa Romeo and Abarth businesses at St Albans, so Cohen is hopeful the three brands will complement one another in the affluent area. That desire for scale presence comes into play again. However, the group is happy with the brands it represents, and further acquisitions will be to reinforce that scale representation. Meanwhile, the existing businesses will not be allowed to stand still.